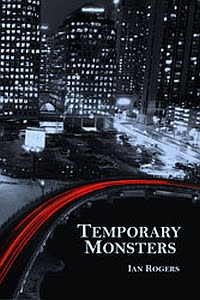 I do love me some gritty urban fantasy, so when The Man Eating Bookworm reviewed this novella by up-and-coming Canadian author, Ian Rogers, it caught my eye. Set in a world in which monsters do exist and the borders between our dimension and a hellish one known as the Black Lands exists as well, Felix is a burned-out private eye with an ex-wife and bills to pay. His latest job has him looking into the background of a movie star who went on a psychotic rampage, in the guise of a vampire, before someone killed him in self-defense--that someone being Felix, no less. Felix soon learns the rising star was not only doing one helluva job as a vampire when he went outhouse crazy in a restaurant, but the movie he was working on in town had him playing a vampire. And when things go wrong with the actor's co-star, who is playing a werewolf ... well, one guess how that turns out. The world Ian has created here is surprisingly robust when barely using thirty pages to not only set the stage, but tell the whole story. The added twist of a drug that seems to temporarily morph users into monsters of choice is both macabre and original. There's a good payoff at the end with enough of a teaser for future installments. In fact, The Ash Angels is the next story in the Black Lands series, which I hope to read sooner rather than later. Seeing Canada portrayed as something other than a snowbound land of overly polite syrup-suckers is always welcome, and Ian did a heckuva job layering grime all over Toronto. I'm looking forward to reading what else he has in store for the great white north and abroad.